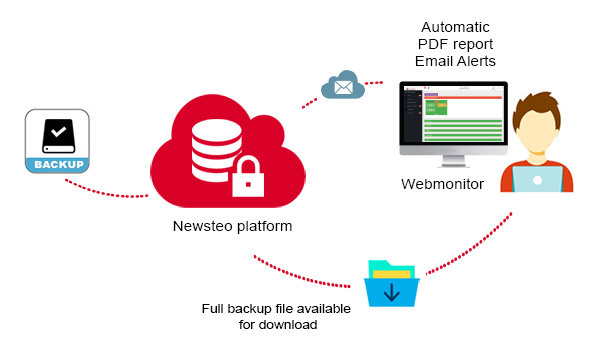 The Newsteo offer of hosting measures in the Cloud allows immediate start up of the solution and also allows you to enjoy exclusive services, such as receiving a database backup each year. 1. The Newsteo Gateway send the measurements on the Newsteo platform , where they are stored. Several gatewaies may send their measurements to a single database. Therefore, only one subscription is necessary. Access to measurements can be performed using DB Monitor software provided by Newsteo or by using the web supervision application: Webmonitor, available on the internet. Each year, Newsteo provides a backup file, including all the measures of the year. 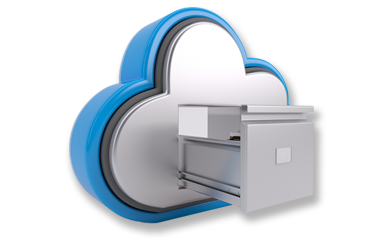 Newsteo also allows its customers to host by themselves their data on their server. However, the simplest solution that is also highly recommended by Newsteo is to give this task to Newsteo. The display stations will access measurements stored on the server via DB Monitor visualization software (thick client). The hosting of the database is a delicate operation. When using a Gateway, it also involves installing scripts provided by Newsteo on the server. 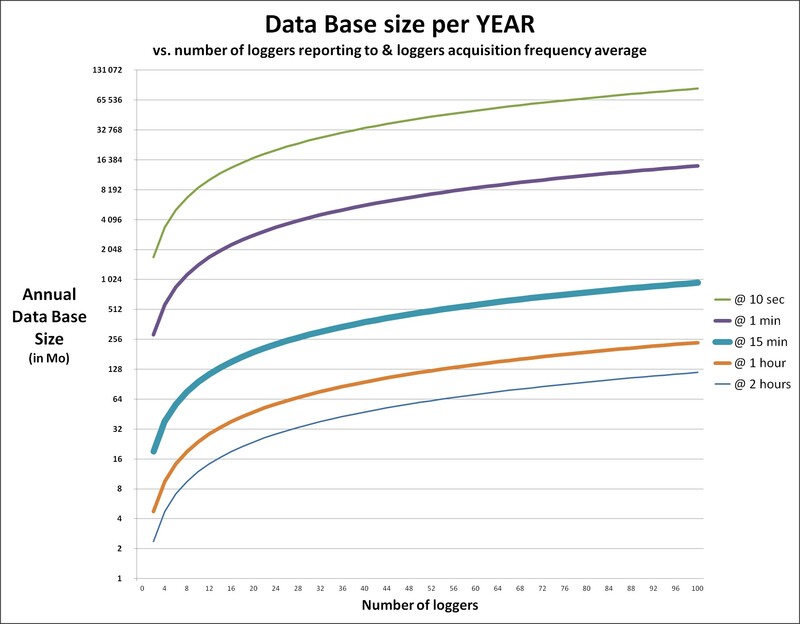 Depending on the number of loggers that communicate with the database and their frequency, this graph is used to evaluate the size of the database. The evaluation is given for use for a year. After one year, it is possible either to save and delete measurements, or to continue using the same base which size will continue to grow in the same proportions. WINDOWS™ SERVER 2008 (highly recommended), but the service can run on WINDOWS™ 7 PRO. No other Windows™ OS is supported so far. Linux is not yet supported. Dual Core CPU with 6 GB of RAM and 1 GB hard drive for WebMonitor software (excluding data space from the database itself).